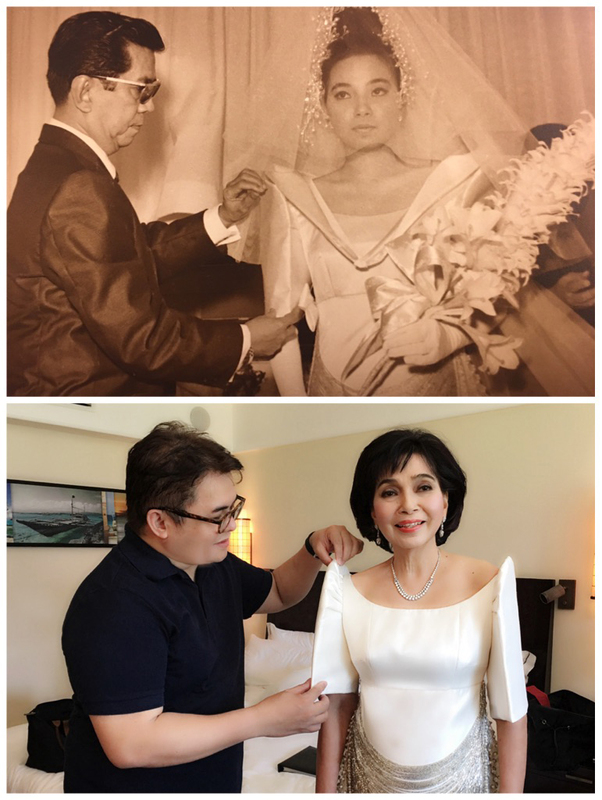 A couple of years ago, Roselyn Tiangco brought me her mother's Ramon Valera bridal trousseau and asked if we can cut the train and use it for her wedding gown. 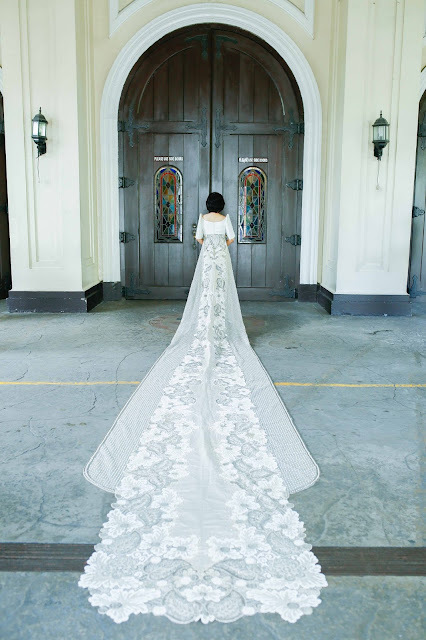 It was a Philippine terno in ivory satin, with bugle beads cascading down the front like waterfalls and a 5 meter train trimmed with Guipure lace and tons of pearls. I was aghast with the thought - no, I wouldn't dare desecrate a Valera. Roselyn and I agreed not to touch the vintage gown, we collaborated instead on simple Dior inspired gown for her wedding. Early this year, Roselyn's mom Mrs. Linda Tiangco brought the Valera gown again, this time it would be for her wedding anniversary. The 50 year old gown gown still fits her perfectly but the bodice was already discolored and some parts of the train were moth eaten. Mrs. Tiangco told me to take my time to study the gown and see what I can do with it. For a month or so, I was just looking at the gown on the dress form, hoping Mrs. Tiangco would change her mind and ask me to do a new gown instead. A very prayerful woman, she must have prayed very hard for my divine guidance, at the same time, sending me cakes from Kitchen's Best every week. I woke up one morning, walked to my workshop to see the gown bathed in sunlight. Call it a eureka moment, I knew then what I had to do. My team and I carefully separated the train from the main body of the gown. We made a new bodice and skirt, following the proportions of Mr. Valera, after which we attached the train again and the waterfall beadwork. We did away with the panuelo, grafting lace from it to fix missing parts on the train. 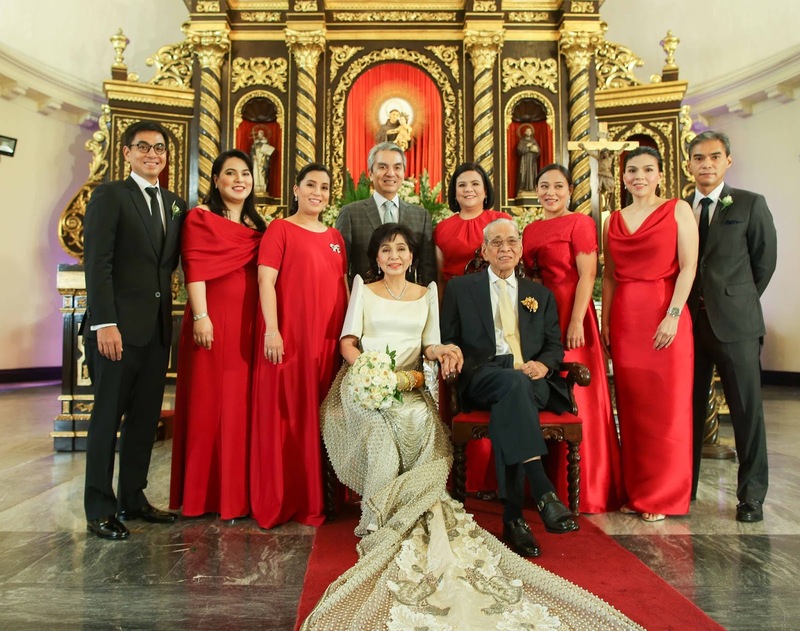 The gown weighed a little more than 9 kilos but Mrs. Tiangco managed the whole stretch of Sanctuario de San Antonio regally, smiling radiantly. Like in a fashion show finale, the guests inside the church stood up to give the bride a rapturous applause. Escorted by her father, Linda Tiangco née Marcelo on her wedding day. Oh my god! This is adorable. Congratulations on the 50th anniversary. She still looks so gorgeous. It is my 10th anniversary this year and I am already very excited. I am planning to celebrate it in one of the same Seattle Wedding venues where we got married. Anyways, it was lovely going through this post.